Wikipedia is now an important part of our life. We use it to learn about many things. It has nearly 4.4 million articles covering information about most of the things. But you should have Internet connection to access Wikipedia. What if you want to download articles for offline? For this, you can use Wikipedia’s create eBook feature to download articles as PDF file. But what if you have complete Wikipedia in your system for offline reading. Yes, it is true. There is a freely available app which brings entire Wikipedia to your computer with nearly 4.4 million articles and 3.7 million images for offline reading. This nice app is Xowa. XOWA is available for Windows, Linux and Mac operating systems. You also required to install Java in your system before start installation. As it brings entire Wikipedia, it takes too much space for storage. You nee to have at least 80 GB free disk space. When you run it in your system and browse articles, you will feel like you are accessing articles in your browser. Search function also works fine for finding articles. When you first run the software, it will import many predefined Wikipedia articles and images. Download and setup process will only take less than 5 minutes depending up on the internet connection speed. There are various sections that will also guide you while using XOWA. 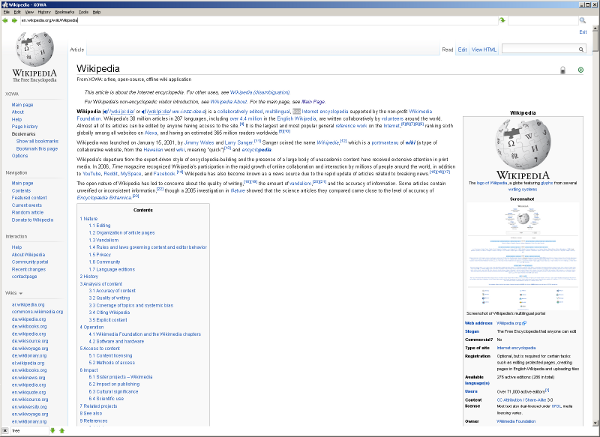 So, download and enjoy Wikipedia in your system and share how you feel.